The Elite game was originally released back in 1984 for the BBC Microcomputer. This PC video game was created by Ian Bell and David Braben and was a space trading combat game that revolutionized video games as we know them. Elite combined wireframe 3D graphics with open ended gameplay which created a unique gaming experience for all. This game begins by launching the player into the open world with 100 credits and a lightly armed cargo ship. The main concept is to earn credits by trading goods between different space stations and making a profit. There was more to the game than this and players could earn credits by entering into different roles during the gameplay. Ships you encountered could be destroyed and plundered, military missions could be taken, asteroids could be mined for resources, and there were bounty hunting contracts that were available. Players could jump between jobs at any time in the game. In the Elite PC game players had to travel between planets using their hyperspace drive. This required fuel which you had to replenish at your destination port. The skill behind the game was in choosing the right items to trade so you earned maximum credits. Missions were varied and military missions mostly involved destroying ships or transporting sensitive cargo. Bounty hunting was great too and these PC missions took players into dangerous territory and often involved fighting higher quality ships and getting greater monetary rewards. Your credits could be spent on ship upgrades to unlock more types of gameplay. Mining lasers could be purchased and the fuel scoop let players catch fuel by flying close to the surface of stars. Back in 1984 the notion of an open world game was unheard of. The Elite game had 8 galaxies and 256 planets in each galaxy. The game had to be procedurally generated. Each galaxy was unique to each player but had planets with pre-determined composition. The issue this created was that occasionally the galaxies would be in positions that the hyperspace drive wasn't powerful enough to get out of again and this broke the game. Planets varied and some were safer than others. The dangers were the Thargoids and pirates. Players couldn't land on planets only the space station that orbited them. 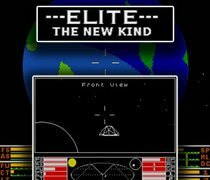 Elite 2 was released in 1993 which added textures, an expanded game world and new control methods. This was followed by Frontier: First Encounters. Elite 4 has been in development since 1999 for the PC and modern gaming consoles. In December of 2014, the kickstarter funded Elite: Dangerous was released for the PC with Mac and console video game versions to follow. Elite: Dangerous was one of the first games to be featured on the Xbox One's Game Preview Program.